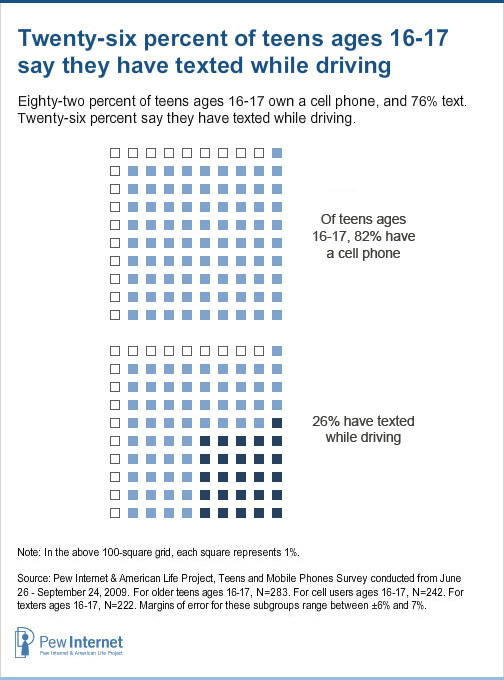 Over the summer of 2009, the Pew Research Center’s Internet & American Life Project conducted a survey of 800 teens ages 12-17 asking about their experiences with cell phone use in cars. All of the teens in our survey were asked about their experiences as passengers, and if they were 16 or older and have a cell phone, they were also asked about their own actions behind the wheel. Additionally, the Project and the University of Michigan conducted 9 focus groups with teens ages 12-18 between June and October 2009 where the topic of driving and mobile phones was addressed. Fully 75% of all American teens ages 12-17 now own a cell phone, and 66% use their phones to send or receive text messages. Older teens are more likely than younger teens to have cell phones and use text messaging; 82% of teens ages 16-17 have a cell phone and 76% text. Overall, 34% of teen texters ages 16-17 say they have texted while driving. That translates into 26% of all American teens ages 16-17. Boys and girls are equally likely to report texting behind the wheel; 34% of each group say they have used text messaging while driving. At the same time, texting at the wheel is less common than having a conversation on the phone while driving. 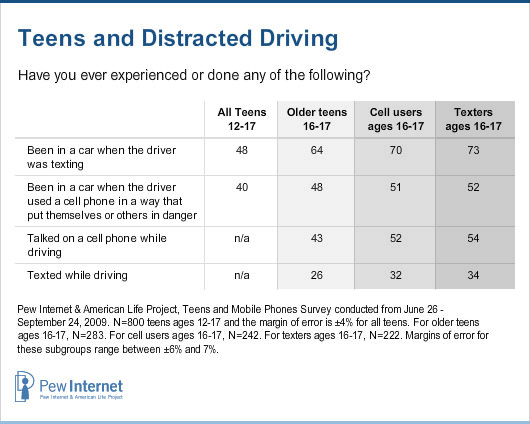 Looking at teens ages 16-17 who have a cell phone, 52% say they have talked on a cell phone while driving. That translates into 43% of all American teens ages 16-17. However, it is important to note that some of these teens may use hands-free devices or a speakerphone function with their cell phones. This survey did not include questions to differentiate between conversations with handheld phones and those that took place with the assistance of a hands-free device or phone feature. Some teens explained other methods for handling calls or texts while on the road “Most of my friends give me their phones to text for them and read their texts, so the driver doesn’t do it themselves,” wrote one older high school girl. Among all teens ages 12-17, 48% say they have been in a car when the driver was texting.10 The older teens in our sample reported a higher incidence of this experience; while 32% of teens ages 12-13 say they have been passengers in a car while the driver was texting at the wheel, 55% of those ages 14-17 report this. Looking only at those who are of driving age—16 and 17 year-olds—the rate jumps to 64%. In a separate question, teens ages 12-17 were asked if they had been in a car when the driver used the cell phone in a way that put themselves or others in danger. Four in ten teens (40%) said they had been in a risky situation like this. Younger teens ages 12-13 are generally less likely to say they have been in a car with a driver who used a cell phone in a dangerous way; 34% report this, compared with 42% of those ages 14-17. Teens of driving age (16-17) are the most likely to report this experience; 48% have been a passenger in a car with a driver who used a cell phone in a risky way. However, it is important to note that the survey question wording does not identify the age of the distracted driver. The teens who were interviewed in the phone survey could be reporting experiences as passengers with adult drivers or other teen drivers. Indeed, as noted above, in the focus group setting, many teens relayed accounts of their parents or other adult relatives texting and talking while driving. While this was cause for concern for some, others felt that their parents and others were “good drivers” who could manage their phones safely. Teen texters are more likely than non-texters to be a passenger of a distracted driver. Teens ages 12-17 who use text messaging report a higher incidence of being passengers when the driver is texting or otherwise using the cell phone in a dangerous way. 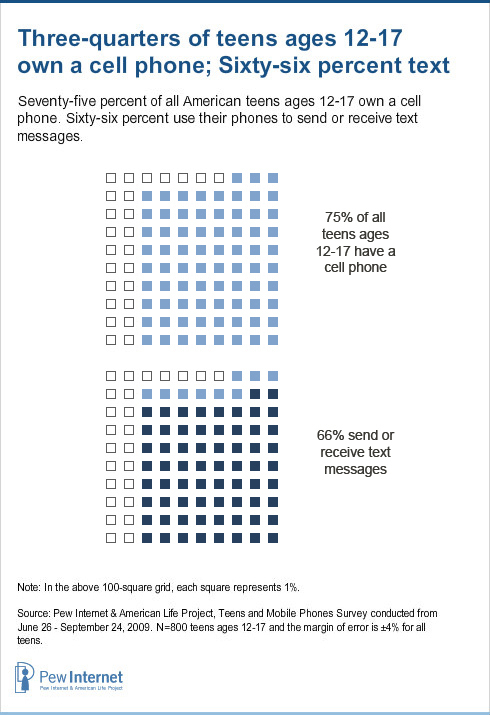 Among all teen texters, 58% say they have been in a car while the driver was texting. That compares with just 28% of non-texting teens. Similarly, 44% of texting teens say they have been in a car when the driver was using a cell phone in a way that put themselves or others in danger, while 31% of non-texting teens have had this experience. Fully 73% of texting teens ages 16-17 have been in a car when the driver was texting. Older texting teens ages 16-17 are even more likely to be in the company of drivers who use their cell phones while at the wheel. Fully 73% of texting teens ages 16-17 have been in a car when the driver was texting. Half (52%) say they have been in a car when the driver used a cell phone in a dangerous way.